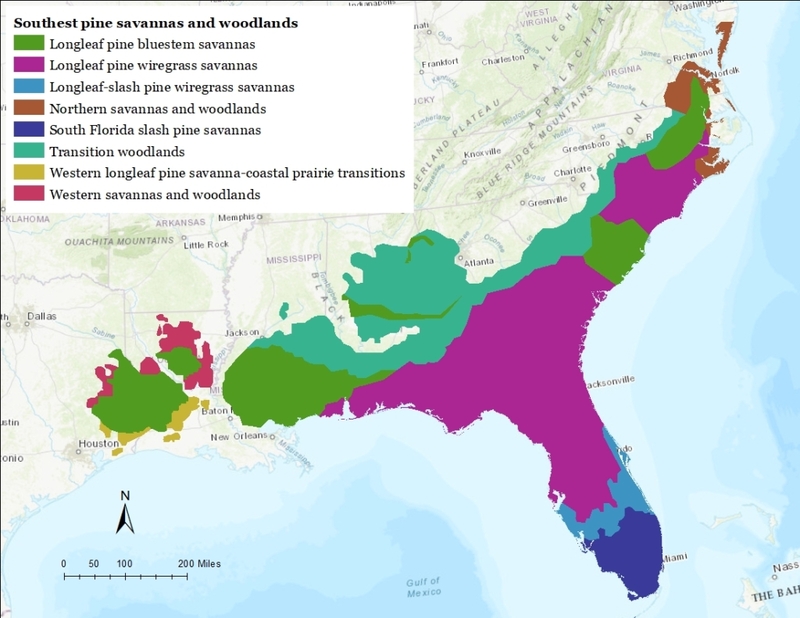 For the first time, we have produced a digitized and newly revised range map of longleaf and slash pine savannas and woodlands across the Southeast. This range map incorporates the latest information on the geographic variation among pine savanna and woodland communities, which will be critical for prioritizing regional conservation, restoration, and management strategies. To make the map, my colleagues and I built on classic maps by Drs. Cecil Frost (1993, 2006) and Bill Platt (1999). Those classic maps were based on even older publications, some dating back to the late 1800s. First, we converted a range map for southern pine savannas and woodlands from Platt (1999) to a boundary shapefile in GIS. Then we modified the boundaries based on the latest information regarding the composition and abundance of canopy tree species and ground-layer grasses, with input from Cecil Frost. Major changes include: (1) adding three more vegetation types compared with the Platt (1999) map, especially in the northern and West Gulf Coastal Plain portions of the map; and (2) changing the boundaries of the range, particularly in eastern North Carolina and Virginia. The new map will be included as a figure in the forthcoming chapter by Peet et al. (2018). The data can be viewed on the South Atlantic Conservation Planning Atlas and the range map boundary shapefile can be downloaded from figshare. In making the map, our aim was to synthesize information on the ranges of these communities from published and unpublished sources that would be relevant at a regional level. So, we freely acknowledge that we are likely missing some local outlier occurrences. In fact, we know of two likely outliers that were not included in this map – one in Dare County, NC, and the other in Powhatan County, VA.
We encourage anyone to download the data and modify or add to it based on local knowledge or to suit any purpose. Our hope is that by making the dataset available, it can help build collective knowledge about the ranges of these systems and advance conservation of the tremendous biodiversity they harbor. Frost, C. C. 1993. Four centuries of changing landscape patterns in the longleaf pine ecosystem. In S. Hermann (Ed. ), Proceedings of the Tall Timbers Fire Ecology Conference, No. 18, The Longleaf Pine Ecosystem: Ecology, Restoration and Management (pp. 17–43). Tall Timbers Research Station, Tallahassee, FL, USA. Frost, C. C. 2006. History and future of the longleaf pine ecosystem. In S. Jose, E. Jokela, & D. Miller (Eds. ), Longleaf Pine Ecosystems: Ecology, Management, and Restoration. (pp. 9–48). Springer, New York, NY, USA. Peet, R.K., Platt, W.J., Costanza, J.K. 2018. The ecology and management of fire-maintained savanna ecosystems of the Southeastern U.S. Coastal Plain. Chapter in: Ecology and Recovery of Eastern Old-Growth Forests. Editors: Keeton, W., Barton, A., Island Press. Platt, W. J. 1999. Southeastern pine savannas. In R. C. Anderson, J. S. Fralish, & J. M. Baskin (Eds. ), The savanna, barren, and rock outcrop communities of North America (pp. 23–51). Cambridge University Press. 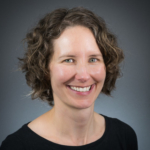 Jen is a Research Assistant Professor in the Department of Forestry and Environmental Resources at NC State University, where she works on issues related to landscape ecology, landscape dynamics, and conservation biology.